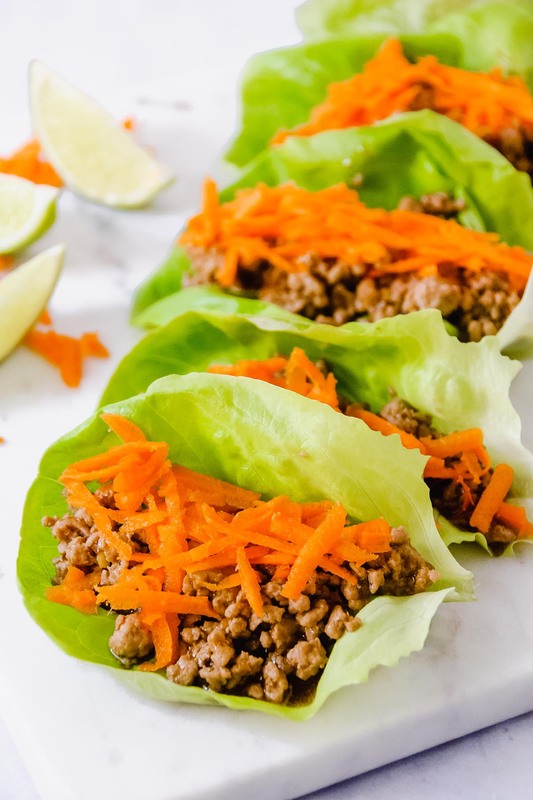 Spicy Garlic Pork Lettuce Wraps are the answer to a quick – 30 minute and it’s ready – weeknight meal for two… or more! Plus, even if you are just two, it’s fun to build your meal together at the table! I hope all of you had a great holiday season and that the new year brings much love, happiness and health. A couple resolutions? None really, just the usual be healthier and make smarter health decisions – I already failed at this, last night I snacked on Christmas cookies and uneaten advent calendar chocolate (way too much I might add). For the blog, I do want to commit to posting twice a week and after taking a break from the blog over the past two weeks I think it is absolutely do-able I have tonnes of ideas! I also want to focus more on quick meals and those portioned for two people – don’t kill me if I write 2 to 3 or 4 servings and tag it cooking for two! Sometimes a portion or two of leftovers is needed for your lunch boxes! Additionally, I want to work farther into the future than I currently do – it is never fun not being happy with the photographs and not having the opportunity to reshoot them because the post is going live the next day. Now for these Spicy Garlic Pork Lettuce Wraps! They are unfussy and quick to put together after a day at work. 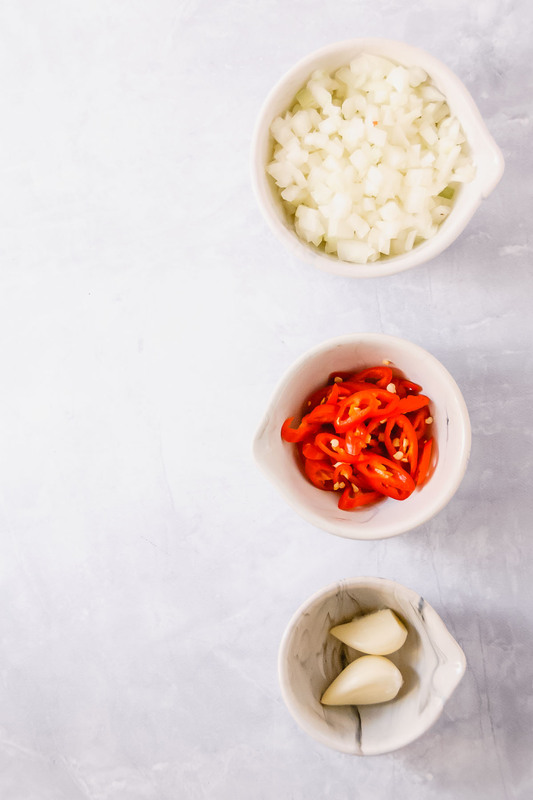 They are refreshing, full of flavor thanks to the staring ingredients pictured above: diced onions, sliced chilis, and garlic! Have them ready for when your other half gets home and you get “Whoa! That looks good!” – at least that is the case at my home. This dish is right up my boyfriend’s ally: meat, veggies and healthy. What makes it up my ally? FLAVOR! I’m all about going for the simple and easy meat and a salad direction. But sometimes (a lot of the time) the flavor is lacking – these wraps are anything but flavor lacking. In fact, you may need to dial down the flavor depending on your preferences. We LOVE garlic… maybe even a little too much sometimes. So you might want to dial it down to one clove. But then again, it’s the winter and I find store bought (comes from China) garlic is less potent, and therefore you’ll have to put more. For this recipe, I decided to take the plunge and bought a bag of Quebec grown garlic. It was five times more expensive but well worth it! Two garlic cloves packed a mean punch. Another flavor profile we do not shy away from is HEAT! One chili pepper sliced with the seeds was the perfect amount of heat for us. If heat is not for you, or you’re divided on the spicy front, omit and save it for a garnish. In addition to being a quick meal they are great in a lunch, just pack the lettuce, carrots and limes in one container and meat in another, microwave the meat to warm it and build your wraps at your desk! YUM! 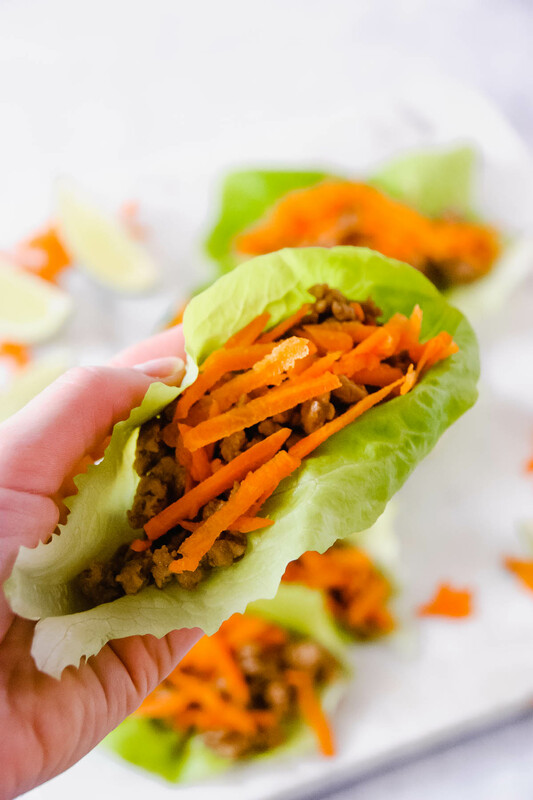 Spicy Garlic Pork Lettuce wraps are the answer to a quick - 30 minute and it’s ready - weeknight meal for two… or more! Plus, even if you are just two, it’s fun to build your meal together at the table! In a medium-sized pan, sauté oil and onion over medium-high until translucent, about 5 minutes. Next, add the garlic and chili slices until fragrant, about 30 seconds. Add pork, and cook until browned, about 8 to 10 minutes. As the pork is cooking, whisk together the broth, soy and cornstarch. When the pork is well browned, give the broth mixture a final mix and add it to the pan. Coat the meat in the sauce by mixing and let it reduce until the sauce is thick and not soupy. 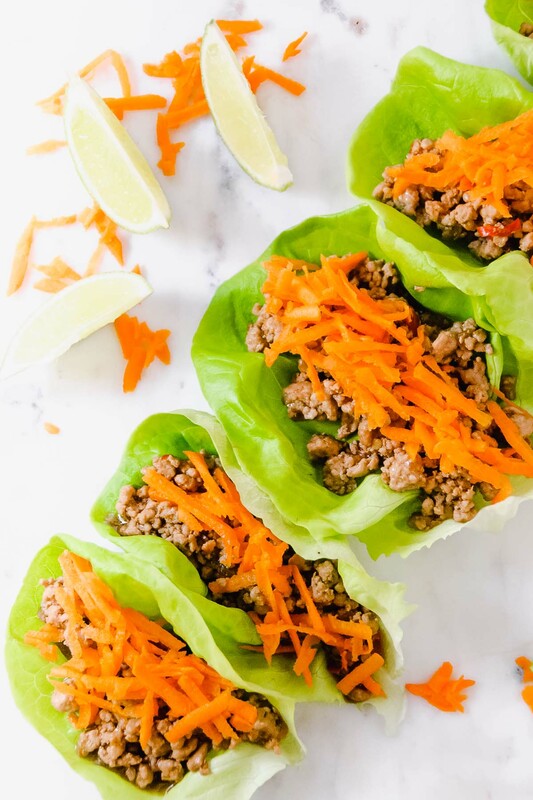 Transfer the meat to a serving bowl and serve alongside the lettuce leaves, carrots and lime wedges - make your wraps at the table! This recipe is easily adjustable to your flavor preferences, use less chili or none if you don't like heat (or want to serve kids); you can also reduce or increase the amount of garlic to your liking. Can be scaled up if you want to serve more people, just make sure to also increase your pan size! Great as leftovers or a packed lunch. I wanna see your tasty creations!